MegaBlaziken, MegaAbsol, MegaMawile, MegaMewtwo, MegaLucario and MegaAmpharos have been confirmed as the first six of the new kind of Pokemon evolution. Remember how Game Freak teased that weird-looking Mewtwo-like Pokemon a while back? The latest edition of Japan's CoroCoro magazine has revealed that it is indeed an evolution of Mewtwo, but not just an ordinary evolution, a mega evolution. That's right, Pokemon X and Y will feature mega evolutions, which rather than your standard evolution are a kind of super-beefed up version of the initial Pokemon. It's basically Super Saiyan but for Pokemon. The Magazine revealed the appearance of the first six of these mega evolutions: MegaBlaziken, MegaAbsol, MegaMawile, MegaMewtwo, MegaLucario and MegaAmpharos. There doesn't seem to be any clear pattern, with some of the megas coming from three-evolution families, some coming from two, and some coming from Pokemon that previously didn't evolve at all. I guess you could consider mega Pokemon the counterpart to "baby" Pokemon introduced back in Gen II. Each of the mega Pokemon will have a special ability that's not normally accessible to them, for example, MegaBlaziken has SpeedBoost while MegaMewtwo has Insomnia. 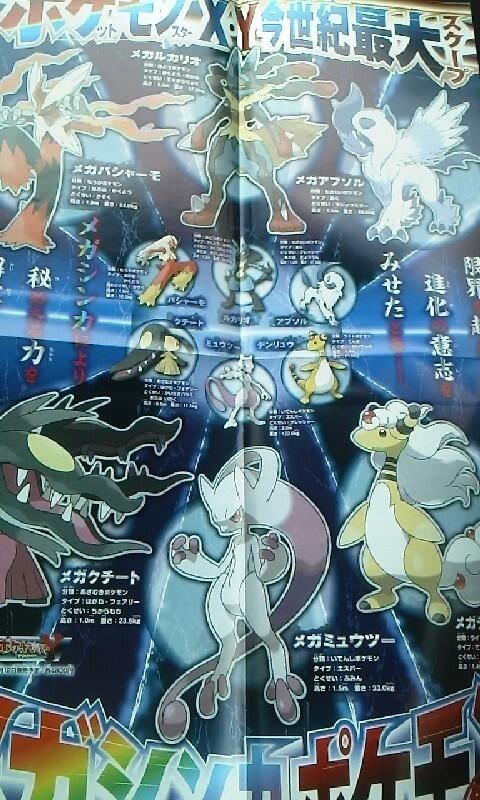 The respective Pokemon reach these forms through "Mega Evolution," though it isn't clear how this will be achieved. Apparently, the key to understanding Mega Evolutions is via a character named Koruni (Japanese name), who is one of Pokemon X and Pokemon Y's Gym Leaders. The magazine also reveals that Torchic, the fire starter from Ruby and Sapphire who can eventually become MegaBlaziken, will be the first distribution event Pokemon. I think these look quite cool, Lucario and Absol in particular. It's nice to see Game Freak revisiting their older, popular Pokemon when working on a new series, as i'm always much more excited to hear about new evolutions for existing Pokemon than brand-new Pokemon.